The comprehensive Laboratory Medicine at Southeast Health is a high tech department that includes an automated robotic system and a broad test menu with rapid turnaround times for specimen processing and result reporting. We also have extensive testing available at the patient’s bedside through our Point of Care department. The main laboratory is open 24 hours a day, 7 days a week and offers a comprehensive test catalog. We are accredited by the College of American Pathology (CAP), and licensed by CLIA and the State of Alabama and Florida. 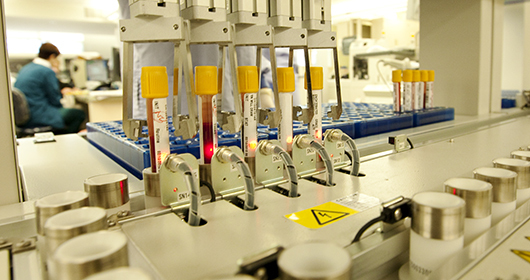 Southeast Health offers a full-service reference lab. Southeast Reference Lab’s main goal is to provide high quality patient care as well as excellent customer service to all of our patients. Our trained staff of lab assistants is here to take care of all of your needs. We offer a program customized to your needs and can work with you to solve any issues that may arise. Southeast Reference Lab is open Monday through Friday, 7:30 a.m. to 5:30 p.m. We are conveniently located on the first floor of the Southeast Health Doctors Building. Please call 334-793-8745 for more information. For billing inquiries and payments, please call 334-712-3242.